Falafel is a product made from chick peas. The herb mix gives the falafel a tasty and spicy flavour and the combination of legumes and vegetables make this a delicious vegan snack. 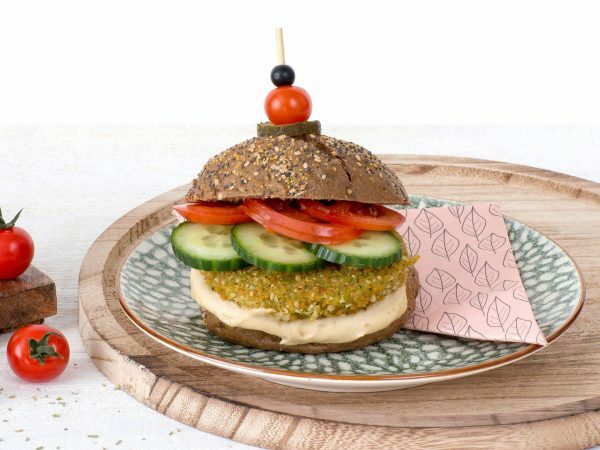 This vegan Falafel Quinoa Burger has a crunchy and spicy quinoa coating and weighs 80 grams. 39% chickpea, breadcrumb (wheat, rye), vegetables (courgette, carrot, onion), wheatflour, sunflower oil, water, parsley, herbs and spices, salt, 1% quinoa, thickener (E461), coriander, wheat gluten. Produced in a facility that processes peanuts and nuts. Frying pan: 4-6 minutes on moderate heat. Turn regularly. Oven: 10 minutes at 180°C. Turn once.